The Kinney Residence is a 3200 square foot home designed on a uniquely shaped lot with multiple constraints. An unbuildable ravine covers half the lot; while tight easement lines and protected trees limit possibilities on the other half. 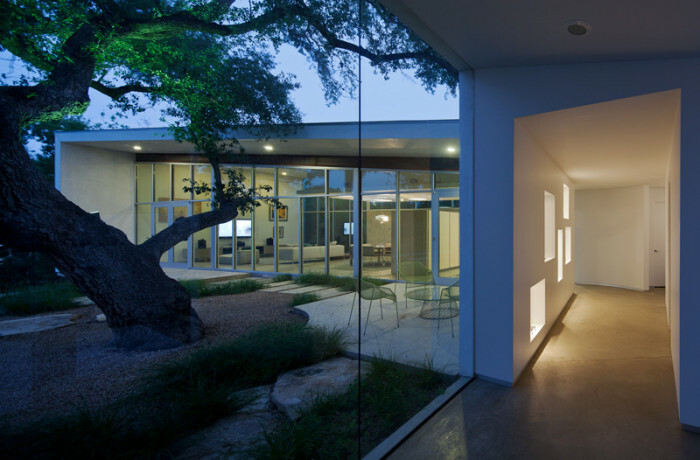 The resulting wishbone-shaped house cradles a 33″ live oak in the middle of the site and divides the house into public and private wings. An amorphously shaped entry connects the two wings of the home. The entry space’s carved volumes selectively reveal and conceal moments, creating a sense of discovery. The one-story public wing optimizes entertainment possibilities by uniting the living room, kitchen and dining room into one space. These spaces share a sloped ceiling that expands into the cantilevered living room that perches over the ravine. Floor to ceiling window walls capture views along the bluff and into the courtyard. A dropped ceiling provides intimacy to the kitchen and dining room that are separated by a row of freestanding cabinetry. The two-story private wing is a simple container for living, with two bedrooms and a study. Second and third story roof decks provide expansive views of Austin’s colorful skyline. Sustainable features include geothermal heating and cooling, reflective TPO roofing, poly-icynene insulation, and thermally broken windows with low-E glass. All finishes have been selected to minimize maintenance over the life cycle of the home.